The winter of 2019 appears to be winding down, at least a little bit. I’m guessing that I’ve got a couple more ice-fishing trips in me, but I can’t get out now, so I’m getting ready for open water. Here’s what I’m doing. I almost always start in my jig boxes. I’ve got a box for walleye jigs and another one for bass jigs. Fire-Ball Jigs are my go-to jig in the spring. The short-shank wide-gap turns the nibblers into catches. There are a few colors that I just have to have. I fish quite a bit, and the areas that I fish in the spring can be jig-eaters, so I make sure that I have at least six of certain colors in the sixteenth and eighth ounce sizes. Those are the sizes that I use the most in the spring. The colors that I rely on the most are Glo Rainbow, Parrot, Glo Watermelon, and Bubblegum. Other colors certainly work, but where I fish in the spring, the water can be stained and the colors mentioned do a good job in stained water. A long-shank Fire-Ball Jig is hitting the shelves now or soon, so I’ll need to get some of those also. When it comes to largemouth bass in the open water season, I throw a jig/worm combination a lot. When the bite is tough, that jig/worm still catches’em. When it comes to a jig for the jig/worm set-up, I really like Strike King’s Tour Grade Jig Head in the 1/16th, 1/8th, and 3/16th ounce sizes. I’ve been fishing Ocho Worms in the 6 inch size on these heads a lot. The hooks are sharp, they’re large, and the keeper prevents the worms from sliding down the hook. With the jig/worm combo, I believe that worm color can be a big factor, but I don’t think the jig color matters so much: Maybe sometimes, but not that often. Therefore, I get 1 jig size in Black, 1 in Watermelon, and 1 in Green Pumpkin. Each size is a different color. Sometimes when I get in a hurry, and if the different size heads are all the same color, I have trouble quickly determining which head is the 1/8th and which one is the 3/16th’s. When they’re different colors, I can tell quickly. Now is the time to spool up with new line. You should start the season with fresh line. I force myself to do so by stripping much of the line off of my reels when I put them away in the late fall or early winter. I take a marking pen and note somewhere on the handle of the rod the style and test of the line. Do so somewhere on the handle where your hand doesn’t come in contact too much, as your hand will eventually erase your note. In the not-so-distant past I used monofilament and braid exclusively, and it was easy to know which was which with a quick look. Since the introduction of P-Line’s Tactical though, I’m using much more fluorocarbon. Tactical is easy to handle, tough, and invisible underwater. Now I have some spinning rods with 6 or 8 pound test CX Premium monofilament and some with 6 or 8 pound test Tactical Fluorocarbon. On the handle of those rods I mark 6M for the 6 pound mono, and 6T for 6 pound Tactical. I can quickly decide which rod I want to use. Last thing: I’m converting my jigs and crankbaits to Lure Lock boxes. These boxes have a sticky material on the bottom that holds the lures in place. The lures don’t rattle, and they don’t bang into each other, which can dull hooks or scratch baits. Open water is on the way, get ready for it now.Be safe, be mobile, be creative, and the next few weeks of ice-fishing could be memorable for you in a good way. Feature Photo: Here’s the author’s walleye crankbait box. 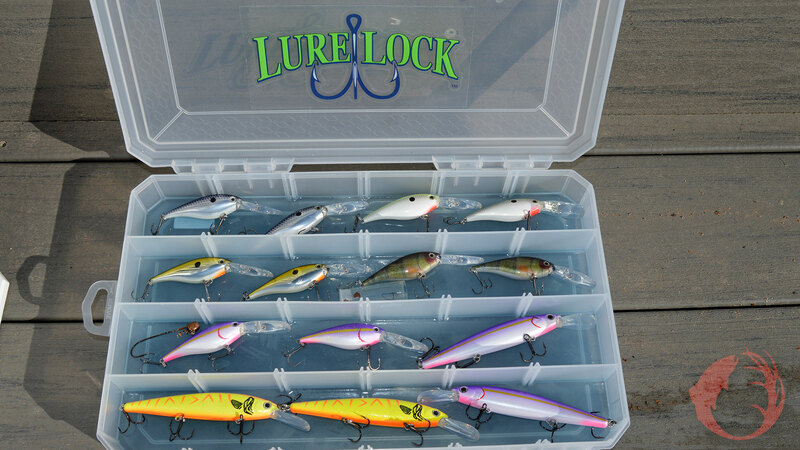 The Lure Lock provides outstanding display, and if it tips over, the baits don’t spill out. To see new and old episodes of Fishing the Midwest television, new and old fishing articles, and fishing video tips, visit fishingthemidwest.com and don’t forget to join us at Facebook.com/fishingthemidwest.